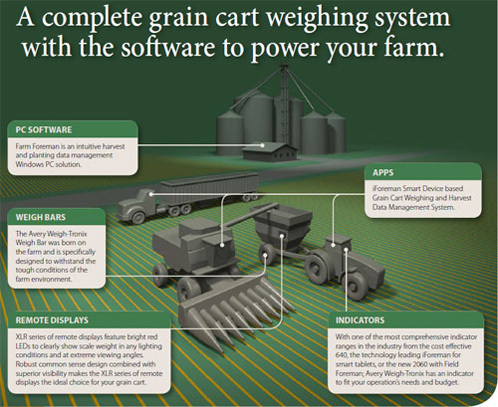 Avery Weigh-Tronix SmartCart Technology Solutions turn your grain cart into a powerful information source and risk management tool. SmartGate is an optional kit which can control an electric over hydraulic auger gate or auger. Once a truck's target gross weight is reached, SmartGate automatically closes the auger gate or stops the auger, helping to eliminate human error and potential truck overloading. 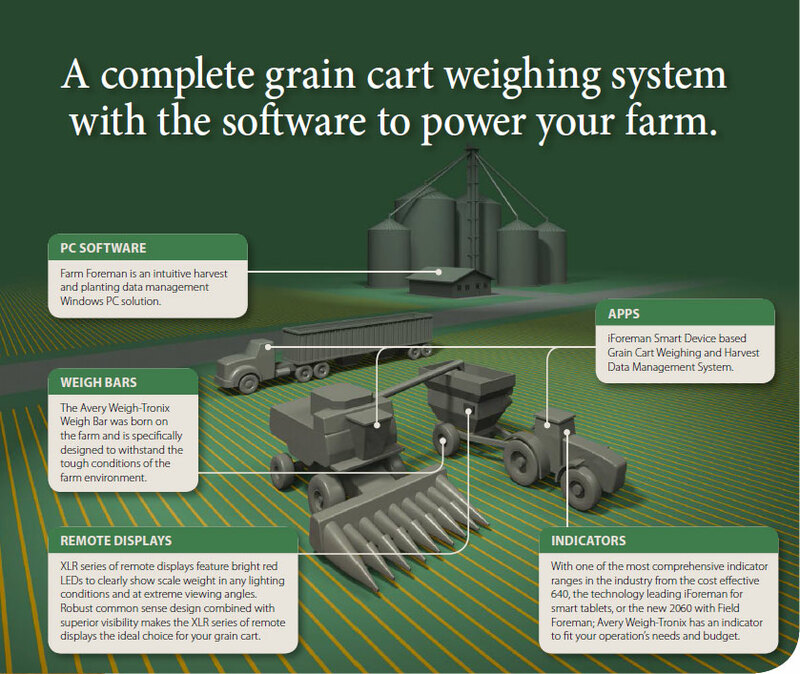 SmartLoad is an advanced auto start and auto save function that is part of Avery Weigh-Tronix's Field Foreman Grain Cart weighing solution. SmartLoad automatically senses the change in weight when the grain cart starts unloading and automatically starts recording the transaction from the original starting weight. 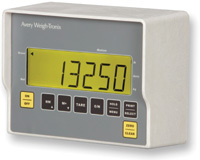 Once it senses the weight has stopped dropping it auto saves the transaction. Eliminating the need to press start and save for transactions greatly reduces the chance for human error resulting in more accurate harvest data of your valuable commodities. This system requires no cables or connections eliminating common failure points for similar solutions on the market. Installation is as simple as hooking up your indicator! Both of these features greatly reduce potential operator and mechanical failure and simplify the process for the end user. Provides a simple, reliable auto start and save function that helps prevent loads being unrecorded and reducing human error. SmartLoad has no cables or magnetic sensors - a common cause of failure. Capable of recording transactions to within 0.5% accuracy of legal for trade scales. Know exactly what came from your field and where it went. Be the master of your harvest inventory. 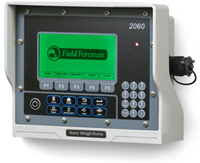 Farm Foreman is an intuitive harvest and planting data management Windows PC solution. Producers input their operation's setup data and transfer to the weight indicator via USB. Planting and Harvesting transactions are easily transferred back to Farm Foreman via USB and data can be managed for multiple grain carts or seed tenders from one PC, eliminating redundant data entry. Farm Foreman allows the user to easily calculate the shrinkage for grain, saving time for manual calculations and avoiding human error. Inventory Management: Knowing exactly what you have delivered to each location, as well as automatically calculating shrink, is just a mouse click away. Managing your postharvest grain inventory has never been easier. Easily track grain or silage: When entering in grain types, the user has the option to mark them as silage. All reports will calculate yield based on tons per acre instead of bushels per acre. This is especially useful for non-grain crops including sugar beets. Data Entry and Management: Enter field setup information at the same time for multiple indicators. Keep track of separate plots within a field by defining hybrid, acres planted, or other customized criteria. Set up delivery truck details with tare and gross weights to prevent exceeding road restrictions. Syncing: Sync 2060 Field Foreman data using a USB thumb drive to the Farm Foreman program on your PC. Reporting: Farm Foreman offers a powerful suite of reports, allowing you to track and report on your operations. The simple, compact M640 indicator fits neatly inside the cab and has grain cart (grain chaser) functions built in. Click here for more information. The CP103 thermal printer is the perfect printer for the farm environment. Click here for more information.